Among foot and knee injuries, ankle damage is also an extremely common occurrence for basketball players. Their constant movement of running, sudden stopping, and cutting and jumping puts a high volume of stress on the ankles. Picture this: a player goes in and jumps for a rebound and he lands in the crowd of players anticipating him at the bottom. The problem awaiting is that it’s so easy for him to heavily land on someone else’s shoe, which can cause his ankle to twist or roll too far inward or outward. If this has ever happened to you, what you are experiencing are your ankle’s ligaments being stretched and torn – otherwise known as a sprain. Depending on the magnitude of your injury, these ligaments may partly or completely tear. Treating a sprain includes a short duration of complete immobilization and oftentimes using a supporting device, like an ankle brace, in order for the ligaments to heal correctly. Ankle braces reduce the amount of stress placed on your ankle and allows you to get back in the game much quicker. Without proper recovery, these injuries are easily prone to re-injury. For basketball players who are suffering from a general ankle sprain and slowly transitioning back into physical activity, the M-Brace Mercurio Ankle Lock #15 is the ideal ankle brace. With its figure eight, cross strap, the brace provides mild to light, medial and lateral compression and support for moderate injuries. Its breathable, 100% cotton velour construction thoroughly ventilates the ankle and foot. And more like a wrap than a brace, it fits and feels similar to a sock, which makes it incredibly comfortable to wear on a daily basis for someone who is in the process of rehabilitating. 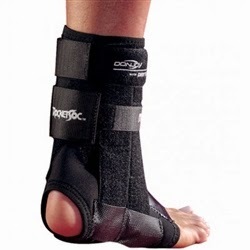 When it comes to treating and preventing acute ankle injuries, the DonJoy RocketSoc Ankle Support Brace is a sure bet. Since it’s important to keep your ligaments still/stabilized and in place after acute sprains, the RocketSoc’s lace-up and strap secure your ankle in a sturdy, yet natural, position. Don’t be fooled by its modest design! As light as it is, you’ll be surprised to see that it provides the maximum amount of support you may need. The straps tightly fasten around your ankle while still allowing you complete range of motion. The McDavid Ankle Brace w/ Straps provides maximum support for people who suffer from chronic ankle sprains or instability. Research has shown that the McDavid ankle brace reduces the chance of injury by 3x. 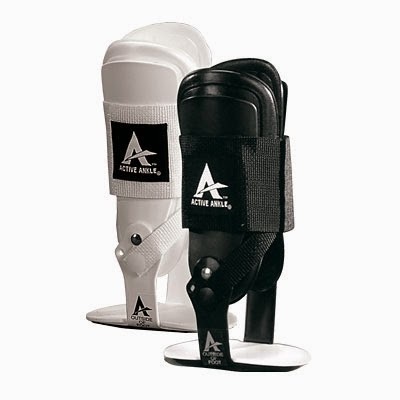 Its figure-6 strap design, single-layer nylon construction, adjustable laces, ventilated tongue and paddled lining are just a few of the ways this brace protects your ankle from medial or lateral vulnerability. Don’t let chronic injuries stop you from living a full and active life. 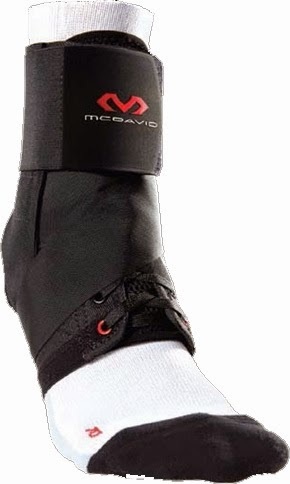 This McDavid ankle brace is just one of the few ankle braces for sprained ankles that can support you and keep you moving at the same time throughout your life and athletic career. Lastly, and perhaps most importantly, an ankle brace should prevent you from further injuries. The Active Innovation T2 Ankle Stirrup is a hinged, U-shaped ankle brace that subdues heavy pressure on your ankle joint and protects your ankle from the harmful inversion and eversion movement (rolling inward and outward) often seen in basketball. The bilateral hinge stabilizes the ankle while still allowing freedom of movement. And the best part about this ankle brace is its ability to mold to the shape and contour of the user’s ankle, promoting comfortable and seamless movement on and off the court. 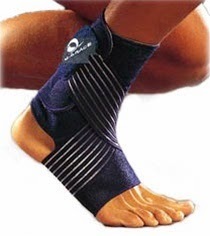 If these braces aren’t quite your cup of tea, visit our Ankle Braces for Basketball page. At MMARMedical, we take care of the hard part for you by researching and selecting the best ankle braces for your specific situation. Browse and find what you’re looking for today.